Amazon advertising can give your brand heightened exposure and product sales in just a few clicks. Amazon’s advertising services are designed to enable brands to improve their visibility, drive demand for products and improve sales. It’s one of the most effective methods of getting your products noticed, fast, on the Amazon marketplace. However, it can become expensive and ineffective if not done correctly. 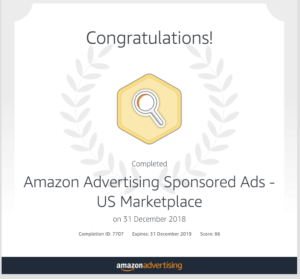 Amazon’s advertising features do vary if you are an Amazon Vendor or an Amazon Seller although, one thing is certain, you’re in full control of how much you spend, when your ads run and how long for. There are three different types of adverts available for marketers, including Headline Search, Sponsored Products and Product Display (available to Amazon Vendors only). If you’re a vendor that needs to get started with Amazon Marketing Services (AMS) or a professional seller who is struggling with sponsored products, we can help. We’re an experienced Amazon advertising agency helping to create, set up and optimise impactful advertising campaigns, for both Amazon UK and Amazon USA, that ensure that your return on investment (ROI) is maximised. Our team can advise, set-up or manage the entire Amazon advertising process. If you need support with advertising on Amazon, we can help. Contact us today to find out how we can amplify your sales. You can also send a message, tweet us or connect with us on LinkedIn. Hillfarm Oils produce a premium extra virgin oil made from British rapeseed. We helped them to launch key products on Amazon, followed by ongoing maintenance, promotions and advertising support.